Our range of products include polypropylene cable identification tapes, polypropylene printed tapes, binder tapes, printed polypropylene tapes, binder polypropylene tapes and cable tape. Polypropylene Colour identification tapes are used for pairing of individual cable conductors from 10 pair to 200 pair. Our ID Tapes are offered in 11 colors and dual color combinations as well. Our monoaxially stretched tapes with high tensile strength and even uniform winding and even distribution of tension aids in easy removal of binder during application on SZ Stranders at high speeds and best suited for spiral helix reinforcements as well. 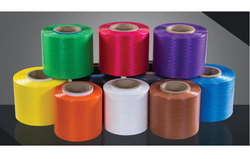 Colored cable identification tapes play an important role as they are used to bind the numerous wire cluster groups or Pairs within the cables for easy identification, used in Copper Communication, Instrumentation, Optic Fiber and Automotive Cables. Cable identification tapes, which come in 11 standard colours, are made from polypropylene and polyethene (PP-PE), with High Tenacity for Speedy Binding. 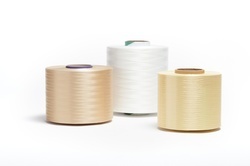 The Bobins are with traverse wound on cardboard slit tubes of various sizes as per requirement and available in different makeups and customised winding of single/dual Ends in each bobbin. Core Identification is used to differentiate the 3 phases of Electricity along with the Company Names Printed on it to prove the originality of the Cable/ Rope/Steel Rope manufacturer. 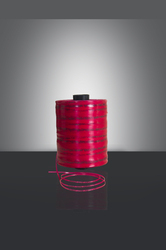 The high tenacity binder tapes, used in Optical Fibre Cables, for Binding Loose Tubes before the Jacketting or Armouring has proven beneficial when compared to Polyester Binders etc as they eliminate the use of Pet Tapes etc after Binding , due to their High Tenacity and Agility in performance on the stranding machine , they are more efficient and also low cost , when compared to other Binders. Printed Polypropylene Tapes are available in a range of 3 mm or 5 mm with printed information on it. 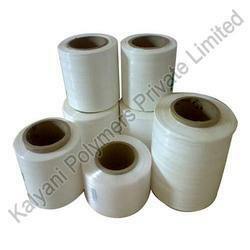 Polypropylene tape is rubber based which makes it suitable for cold temperature packing purposes. These are manufactured using premium quality materials and according to the international quality standards. 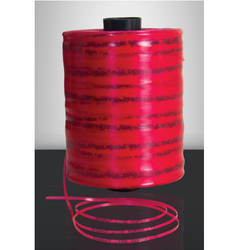 We offer these tapes at affordable prices in the market. We provide unmatched range of Binder Polypropylene Tapes, in a wide range to our esteemed clients at comprehensive price. These are specially designed and made under the leadership of our expert professions who use premium quality materials. We provide these products that are used in optical fiber cables. These are available in different sizes and colors. We export these products from different dimensions. We offer Cable Tape for use in Instrumentation, Control, OFC and Telecom Cables with varied Breaking Loads of XLPE, PVE sheathing etc, The Ply can be varied from 2 plies to 5 Ply to enhance the Breaking Load , and also the Twist Per Inch can be Specified to correlate with the Diameter of the Cord. Looking for Cable Identification Tapes ?